Chapel Haven Church and The Edge SDA Worship Center officially merge » This has been an amazing journey to watch unfold. Since the two churches joined together, they are praising the Lord that the average attendance has been 210. Below is what Robert Coronado, pastor, has written about how all of this came to be. Ecuador » Elaine Cloninger, from the Rifle Church in Colorado, shares the story of a very successful, gratifying mission trip to Ecuador. “Most Seventh-day Adventists have seen articles and videos on Maranatha’s One-Day churches and have said, ‘I would like to do that!’ A group of 14 people from the Copper Mountain, Leadville, Glenwood Springs English and Rifle English churches, including our pastor, Ruddy Vivanco, and his wife, Vivien Vasquez, followed through with that desire for a week in June. During a five-day period, we started three structures in Pastor Ruddy and Vivien’s homeland of Ecuador. “Additionally, the group also conducted a free health screening clinic during the days at each location, under the leadership of nurses Linda Caswell, from the hospital in Vail, and Laurie Cross, from the hospital in Aspen. The volunteers took medical supplies and reading glasses that were much appreciated. 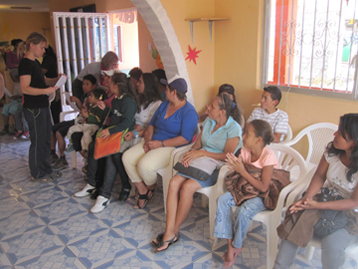 More than 400 local people were screened at the clinics. Pastor Ruddy, Vivien and a Glenwood Springs member, Dita Baranek, translated. 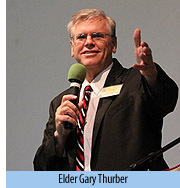 Wyoming Camp Meeting ignites a renewed passion for evangelism » An amazing spirit among those who attended camp meeting in Wyoming brought forth a unified effort among members to see the Gospel work in this territory move forward. What happened was not the result of a well-orchestrated plan unrolled by the Conference, but rather the Lord working on the hearts of the people who attended. 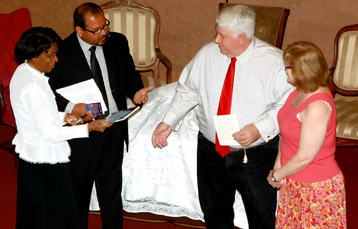 To read about what happened and the astonishing results, click here. Special outreach for the fire victims » The Lord has put on the heart of Christine Kelly, a member of the Colorado Springs Church in Colorado, a very special outreach to those who were affected by the recent fires. She and her therapy dog, Ginger, have already been ministering to the victims, and she wants to invite others to join her. Read below to learn about her ministry. “God put it on my heart to adopt the addresses impacted by the fire. We know that there is a total of 936 homes in the area, and 346 burned down. That leaves 590 homes still standing. Praise the Lord! Those with houses still standing are also still displaced due to cleanup efforts. So, all of them need encouragement. 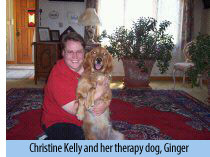 To learn more about how Ginger, the therapy dog, works with Christine to help those who are hurting, click here. High Park Fire relief efforts continue » Cathy Kissner, ACS DR coordinator, reports that the High Park Fire Recovery Distribution Center is still up and running well. Most recently, a group of young people on a mission project came and helped them transfer the items at the Center to another building. To date, the Center has distributed more than 50,000 items with the help of 4,139 volunteers. The center is still in need of the following items. To help at the Center or to make donations, you may contact Cathy at 970.201.3799 or by email her at [email protected]. My wife, Diane, and I are going back and forth between the NE Colorado Camp Meeting, where Elder Roscoe Howard is preaching, and the Mid-America Union Camporee, where we have more than 400 of our young people participating in this great event. Hubert Cisneros, our Union youth leader, and his team, have brought in many great speakers for this event — Elder Dan Jackson, Elder James Black, Elder Ron Whitehead and Elder Tom Lemon to name just a few. Next week, we will share pictures to tell the story of how these events impacted those who attended. There aren’t any of us who weren’t affected by the tragic shooting in Aurora last week. For me, it was just one of those moments where the repulsion of sin was exposed anew. This just makes me want to see Jesus come all the more! God bless as each of you move into the Sabbath hours. I pray our worship together will bring joy to our Savior’s heart and bring us His peace in this troubled world.